Citi Housing Scheme Faisalabad is located on main Sargodha Road near Faisalabad-Pindi Bhatiyan Motorway Interchange. It is planned in the outskirts of the city in order to enjoy the serenity of environment away from the hustle and bustle of the city. This location falls under the region of Kamalpur Faisalabad. Citi Housing Scheme Faisalabad caters to the housing requirements of different stratas of the society by offering different plot sizes in its gigantic housing scheme. Plots are offered on 3 year installment plan which includes down payment and 11 quarterly installments. Some discount is also included with down payment of each plot against registration forms. 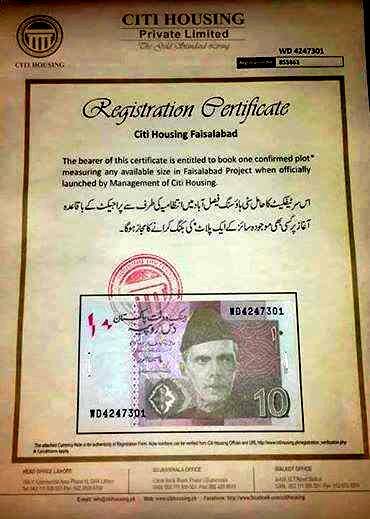 Citi Housing Scheme Faisalabad allowed bookings to registered members who had either registered themselves in this scheme when registration process was started, or purchased open registration certificates later on from the market. These registration forms had high demand in the market and many investors earned a fortune just by trading in these forms. These registration forms come with 10 rupees note, and the registration number is same as the number given on the currency note. That is one of the safest way to avoid duplication of registration forms being used by many other housing schemes. Citi Housing Faisalabad offer world class living facilities and amenities to its residents which are not only limited to the basic facilities of water, gas, and underground electricity but also power backup system, international standard Parks, Zoological garden, Masjids and Schools. The society is surrounded by a boundary wall with round the clock security and surveillance systems considering the law & order situation of the country. The society follows the standard of minimum 40 feet wide streets which is usually not followed in many local housing schemes and towns. The society will have fully equipped hospital, health club, community center, banks, commercial areas for multi-national brands and different food chains to serve the community.